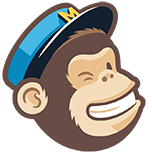 Mailchimp is a popular email marketing solution. This tool allows users to simplify the creation, sending and reporting from their marketing campaigns, email blasts, and newsletters. The integration of Sellsy with Mailchimp allows you to very easily synchronise your Sellsy contacts with your Mailchimp account. You thus have your prospect and customer files constantly up to date when you access Mailchimp. To connect your Mailchimp account you can use the native integration in your Sellsy account but also create a zap with Sellsy's Zapier integration.